Wherever we are in Bandar Seri Begawan, Brunei's capital city, we can't help noticing the Sultan Omar Ali Saifuddien Mosque dominating the skyline of the city centre of Bandar Seri Begawan. Mosques have long dominated the skyline in Brunei. In 1578 during the reign of Sultan Saiful Rizal, a Spanish traveler, Alonso Beltran described the main mosque as one made up of five layers. The Sultan Omar Ali Saifuddien Mosque is said to be one of the most beautiful mosques in the Southeast Asian region. It symbolised the country’s official religion of Islam. However not many people realised that prior to its completion in 1958, there was no proper mosque in the capital city, then known as Pekan Brunei. 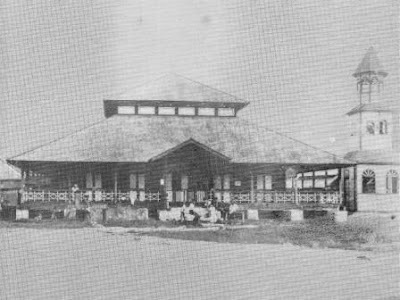 Before the Second World War, even though there were a number of other mosques built in the countryside, the only mosque that was built in the capital city was called Masjid Marbut Pak Tunggal (also known as Masjid Pekan Brunei) which was built during the era of Sultan Mohammad Jamalul Alam II, the 26th Sultan. This mosque was located by the river approximately nearby where the current Sultan Omar Ali Saifuddien Mosque is. The mosque was made out of timber with an asbestos roofing and a small rocket like minaret attached to it. The building was raised about a foot off the ground with concrete base. This mosque was clearly visible in some of the aerial photographs taken during the Second World War (try to spot the mosque in the photo). Unfortunately during the Japanese occupation, the mosque was destroyed. 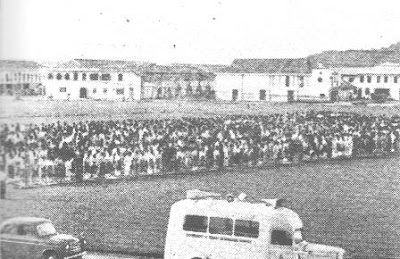 A temporary mosque catering to about 500 worshippers was built immediately after the war. This was sited where the TAIB Building is currently located. It was more like a temporary prayer hall rather than a proper mosque for Brunei Muslims to congregate for their prayers. The building structure was made out of timber with the roof made out of thatched palm leaves and the walls out of thatched nipah leaves. Built on top of the roof was a small tower. Everything about the mosque signifies that it was temporary. It was never given a proper name but was always known as Masjid Kajang (named after the type of roof material used). Despite that it was widely used until 1958 when the Sultan Omar Ali Saifuddien Mosque was completed. However Masjid Kajang was relatively small and for bigger congregation, the prayers would be held out in the open at the Padang (now known as Taman Haji Omar Ali Saifuddien) in the town centre. His Majesty Sultan Haji Omar Ali Saifuddien himself prayed together with his subjects out in the open air. 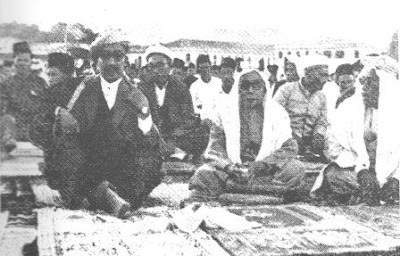 By 1949, a committee had been formed to look into the possibility of building a national mosque. 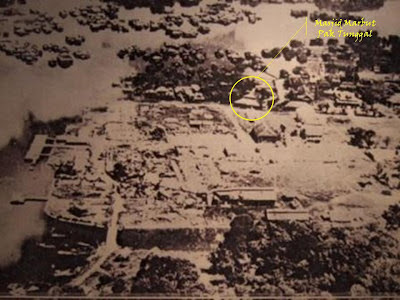 The first site proposed by the committee chaired by YTM Seri Paduka Pengiran Bendahara Pengiran Anak Haji Muhammad Yasin in December 1952 for the location of the new mosque was the Padang itself. However His Majesty Sultan Haji Omar Ali Saifuddien preferred the site to be where it is situated currently which is on the riverside and at that time considered as the town centre. According to Pengiran Adnan, a Senior Architect at the Public Works Department (PWD), the architect employed to design the mosque was an Italian named Cavalieri R. Nolli based upon an early design prepared by His Majesty himself and drawn with the assistance of Awang Besar Sagap, a PWD draughtsman. 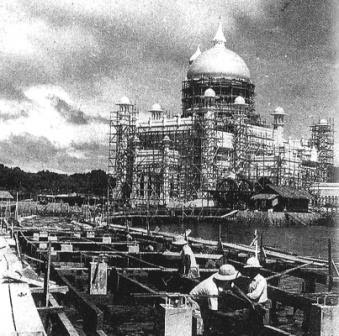 The detailed architectural plan was prepared by Booty and Edwards Chartered Architects and the construction work was done by Sino-Malayan Engineer. The construction costs were very modest estimated to be around $7.7 million to $9.2 million. The design was heavily influenced by Mughal architecture in India. The Mughal Emperors who ruled India for about 350 years from the early 16th Century, built many of India’s beautiful historical mosques and buildings including the Taj Mahal. Work started on building the mosque on 4th February 1954. The mosque is sited on a 5 acre site and the actual size of the mosque is 225 feet by 86 feet. It has a capacity of about 3,000. The mosque used many of the world's most elegant materials, including marble from Italy, granite from Shanghai, stained glass and chandeliers weighing four tons and two tons from England and handmade carpets from Belgium and Saudi Arabia. Its maximum height is 52 meters and is topped with a gold dome supported by walls of Italian marble, which also forms the mosque's columns, arches, and towers. One of the local elements incorporated into the design was the ‘kalat’ (very thick rope) shaped design which are plastered winding on all the outside columns. In the Brunei tradition of building ‘lapau’ (halls), the actual kalat rope is used to install the columns and it is usually dyed with many colours and gold. It has been said in the architectural world that the main dome is the mosque's most recognisable feature covered in gold. The main minaret incorporated an unusual mixed of Renaissance and Italian architectural style which is not seen in many mosques in the world. The mosque's interior itself was filled with elements of Islamic art especially the calligraphy, flowers, geometric and the likes. Even though the mosque was officially opened by His Majesty on the 26th September 1958, the artificial barge located in the lagoon beside the mosque was built much later and was completed in 1967. The barge, a replica of a 16th Century Sultan Bolkiah mahligai barge was used to stage Al-Quran reading competitions. It was built to commemorate the 1,400th anniversary of Nuzul Al-Quran (coming down of the Al-Quran) and cost $¼ million. Today the Sultan Omar Ali Saifuddien Mosque has become Brunei’s best known landmark as well as a praying place for Brunei Muslims. Copyright (c) BRUNEIresources.com, 2005-2007. All Rights Reserved.